Ripon Landscapes is run by John Gotts, a highly experienced gardener and landscaper. John has been involved in all areas of horticulture and garden design all his working life, starting with an apprenticeship directly after leaving school. On qualifying with a Level 2 NVQ John joined a landscaping contractor in Yarm where he worked for six years during which time he perfected his skills building countless patios, laying paving and footpaths and carrying out all kinds of garden groundwork. After a 6 month trip to Australia, where he continued with garden maintenance, clearance and footpath building in a very different climate, the call of Yorkshire was too strong and he returned. 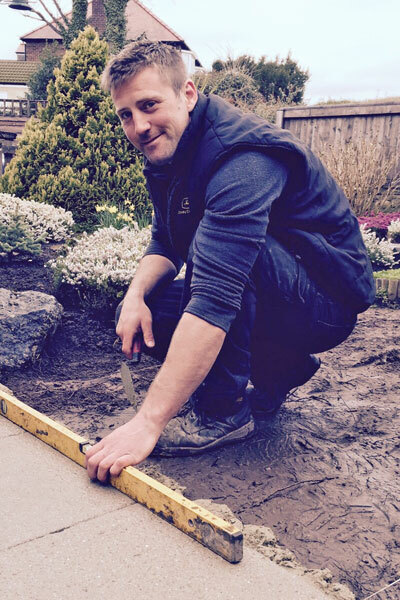 For 4 years John worked at Stainton Landscapes on both hard and soft landscaping projects. In 2015, deciding the time was right to launch out on his own, he established Ripon Landscapes. With an ethos of hard work and diligence, John pays real attention to detail and is very creative, honest and approachable - a true Yorkshire gentleman. He always takes great pleasure watching a project develop, and works closely with his customers to ensure their 'dream garden' is brought to life. He believes that a job well done and appreciated by the client is where the job’s real satisfaction lies. Then, once a job is complete, there’s nothing he likes more than to carry on caring for a garden he’s created and working with its owners to adapt it to their changing needs. Born to be outdoors, when not at work you can generally find John scaling Yorkshire's great mountains and hills, dog and girlfriend in tow!